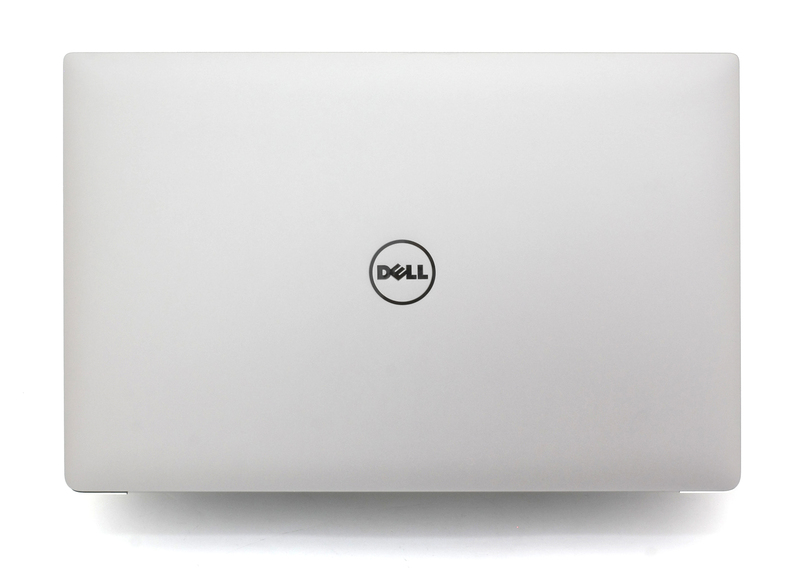 Dell’s XPS lineup received a lot of praise in the last two years and we mostly agree with the positive reviews out there but if you opt for the 15-inch version, you should consider a good number of cons. 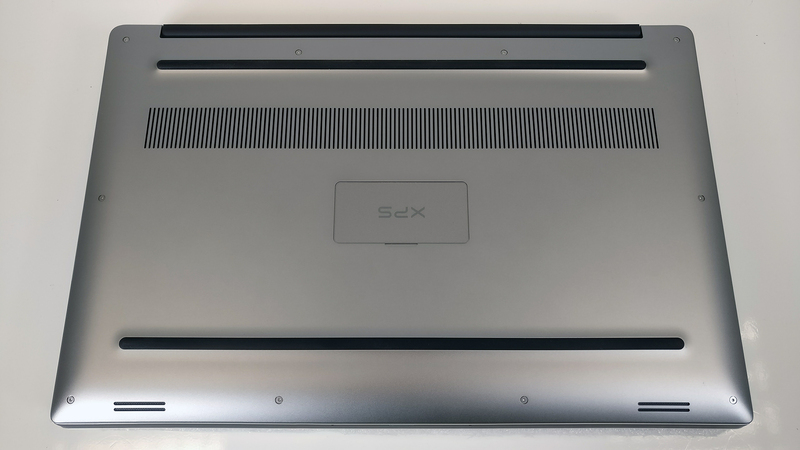 If you read our review of the previous generation XPS 15 with UHD screen, you’d remember that the demanding nature of the hardware (CPU and GPU) combined with extra slim profile raised some concerns about the stability and the effectiveness of the cooling system and thus, kept us from giving an excellent score. We were also disappointed by the audio quality, battery life and loud fan operations. 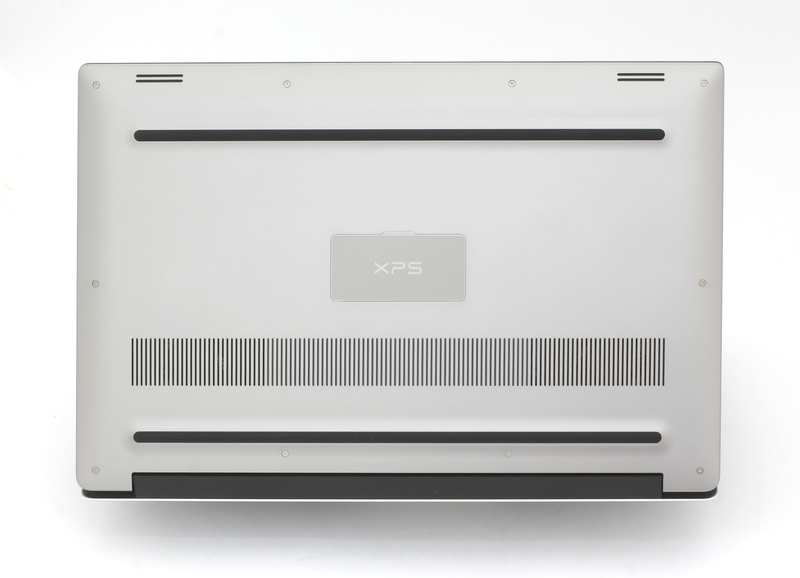 But even if the this year’s XPS 15 looks just about the same, you are wrong. Packing totally new hardware under the hood, we expect the cooling system to be able to support the Core i7-7700HQ CPU and GTX 1050 GPU. The former is expected to generate just as much heat but we expect some serious temperature drops in our tests from the GTX 1050. Also, we would like to review the Full HD version of the notebook this time and assess how this affects battery life compared to the UHD version from last year and see if it’s any good for multimedia and color-sensitive work. The box contains all the usual user manuals, AC adapter, power cord and the laptop itself, which is in a slim, black, premium-looking box. The chassis remains the same as before without any changes at all. But that’s mainly a good thing because there’s absolutely nothing to criticize when it comes to build quality and design. 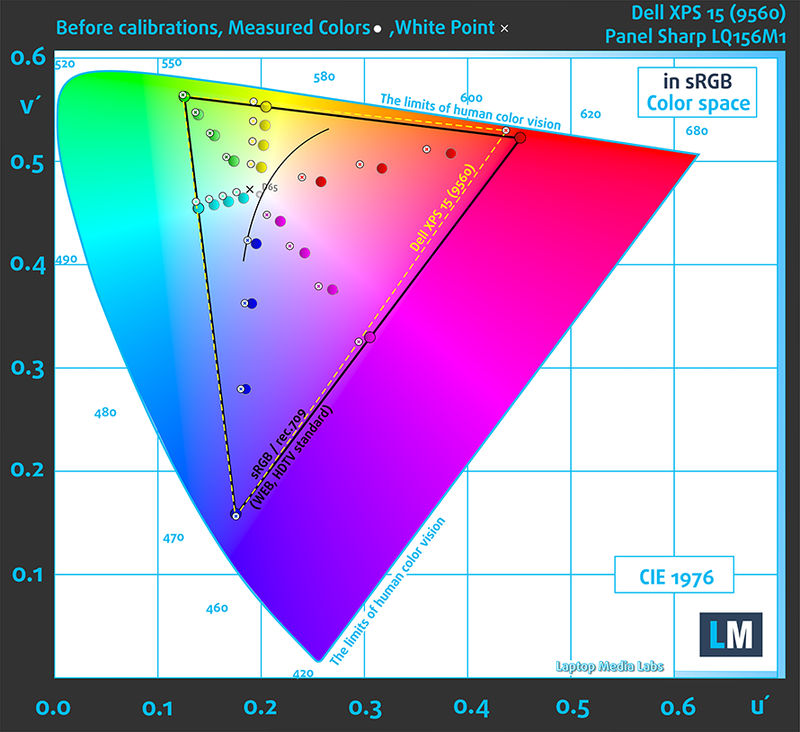 The XPS 15 also retains weight and dimensions by tipping the scale at just 1.8 kg for the reviewed version and going up to 2.0 kg for the UHD touch variant. The thickness of the chassis goes from 11 to 17 mm – just like before. Let’s go over the chassis once more. We’ve got anodized aluminum lid with chamfered edges. It’s also pretty rigid and there’s no flex when pressed in the middle. Unfortunately, we didn’t like the hinge design so much because it feels way overly tightened. It requires both hands during the whole travel and our best guess is that this prevents serious wobbling on the touch version. In our opinion, the non-touch version definitely needs a looser hinge but we do have to give credit to the smooth and reliable movement. Anyway, opening the lid reveals the near borderless Full HD matte screen and a bit awkward webcam placement. In any case, the thin bezels cut off a bit from the sides making it one of the most compact 15-inchers on the market. 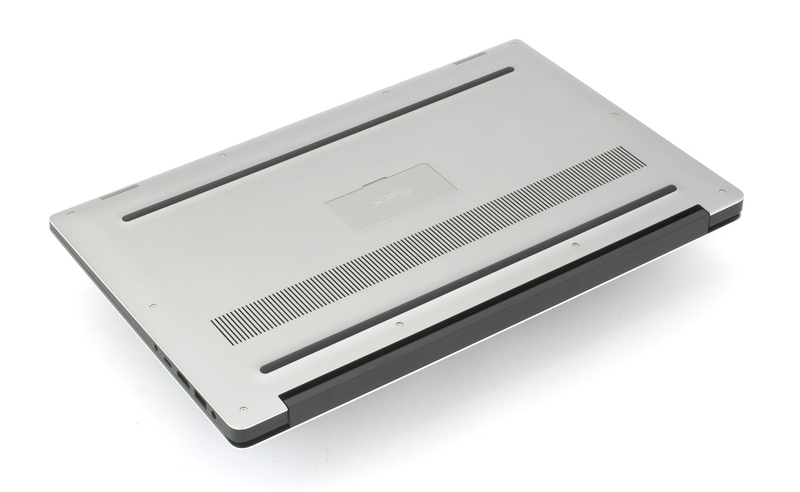 The bottom plate is still made of anodized aluminum with the well-known grill for extra airflow. The sides offer the same flat design with healthy port distribution. On the left, we see the DC charging port, USB 3.0 connector, HDMI, 3.5 mm audio jack and a USB-C 3.1 port supporting Thunderbolt 3 standard as well. On the right, you will see the button that lights up the battery gauge, another USB 3.0 port, and the SD card reader. Some users might consider the sides lacking some of the ports but two USB-A 3.0 connectors along with the high-bandwidth USB-C Thunderbolt should be more than enough. There’s only one considerable drawback of the interior – it’s a fingerprint magnet. Yes, it looks really cool with the soft-touch and slightly transparent surface that lets the carbon-fiber peeking from beneath, but it also requires frequent cleaning. Everything else is just flawless. 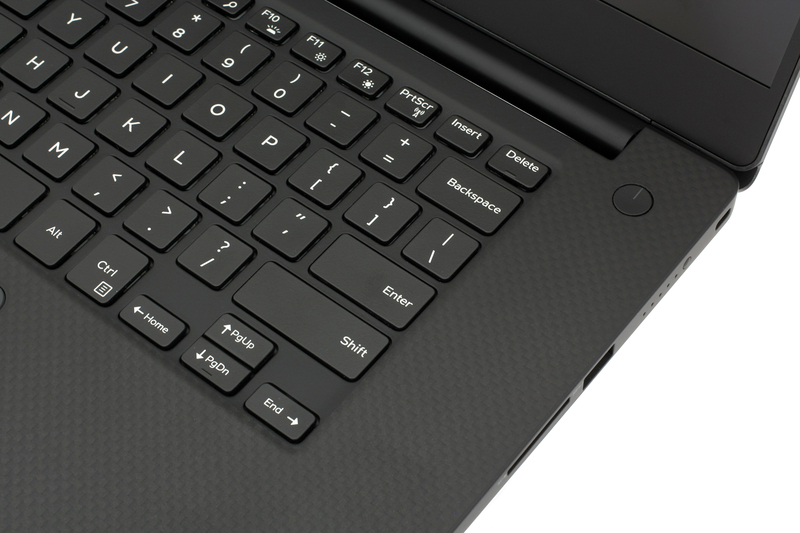 As before, we liked the keyboard with its relatively short (1.3 mm) key travel but satisfying clicky feedback. It misses the Numpad area so you can get a better, more comfortable keyboard placement in the middle of the interior. The big touchpad is also centered and offers exceptional feel – light clicks, responsive, excellent gliding surface, registers all swipes and gestures accurately and it’s just a pleasure to use. The notebook makes no compromise when it comes to build quality and design. For the asking price, we weren’t expecting anything less and Dell delivered once again with their latest alteration of the XPS 15. Its minimalistic design, choice of materials and feel should appeal to a broader audience. 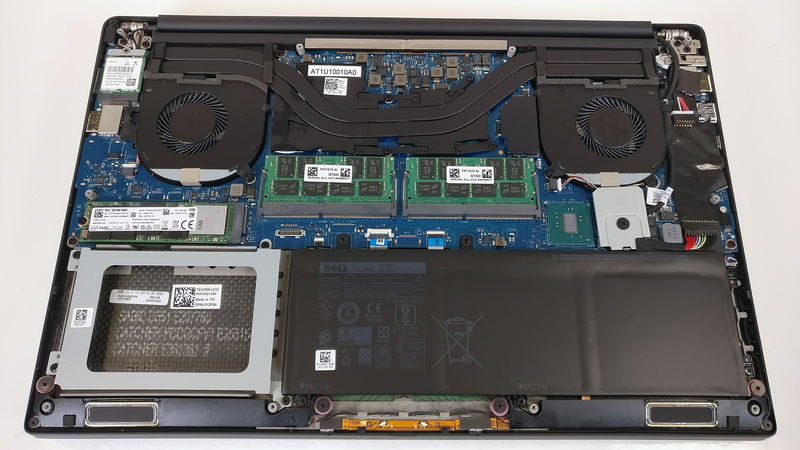 Like last year’s model, the XPS 15 offers fairly easy access to all of the internals and requires only simple unscrewing. 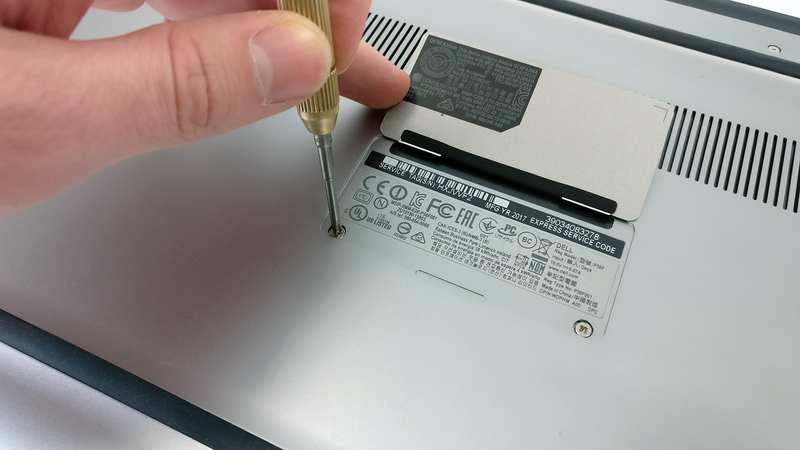 Make sure you’ve removed the screws under the cap as well, as shown in the pictures below. 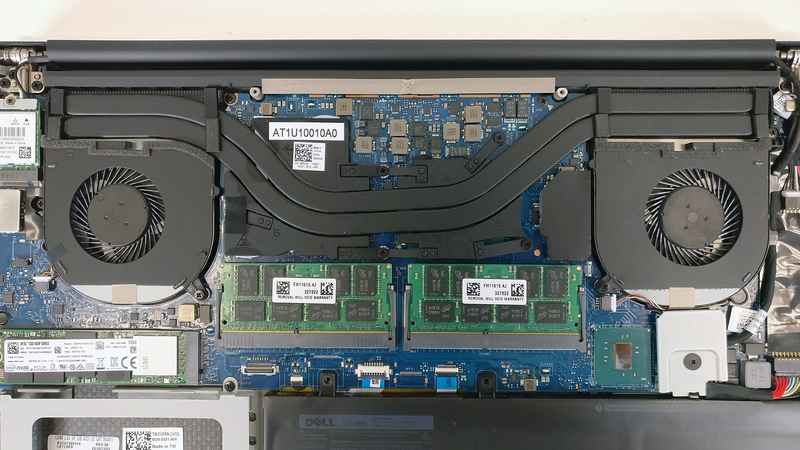 The positive change here is that the laptop uses a more conventional M.2 SSD standard. The slot supports 2280 SSDs and our unit came with a 512GB Intel 600P series supporting the latest PCIe NVMe standard. The 2.5-inch HDD slot is empty but luckily, Dell has included a bracket for the HDD but not the cable. 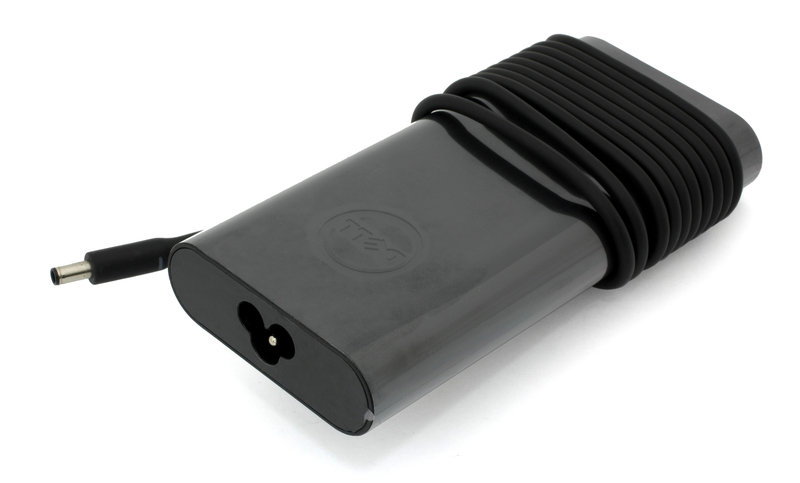 Also, if you order the model without the HDD option, you will benefit from a much larger 97Wh battery. You can see the RAM chips right under the heat sinks. In our case, the unit uses two 8GB DDR4-2400 chips but you can go for up to 16GB. 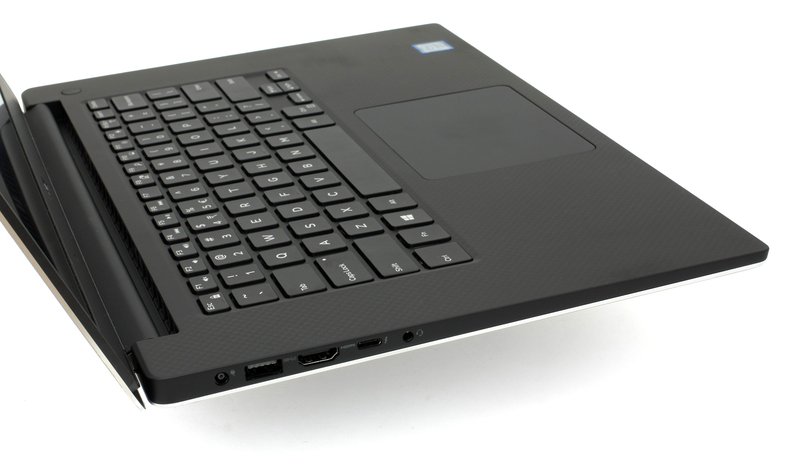 As we already pointed out, we got the “budget” version of the laptop that houses a 56Wh unit. The system uses a fairly standard cooling design with two big heat pipes going across the heat sinks and connecting the two cooling fans on each side of the machine. Since we didn’t review the Full HD version of this machine last year, we did a quick research and found out that the OEM has used the same panel from the previous generation. It’s manufactured by Sharp with model number SHP1453 (LQ156M1) with 15.6-inch diagonal, with 1920 x 1080 pixels resolution, 142 ppi pixel density and 0.18 x 0.18 mm pixel pitch. It can be considered as “Retina” when viewed from a distance equal or greater than 60 cm. We were able to record quite the maximum brightness – 393 cd/m2 in the center and 383 cd/m2 as average across the surface with just 8% deviation. The color temperature is 6900K which means that colors will appear slightly cold-ish/blue-ish compared to the optimal 6500K white point. 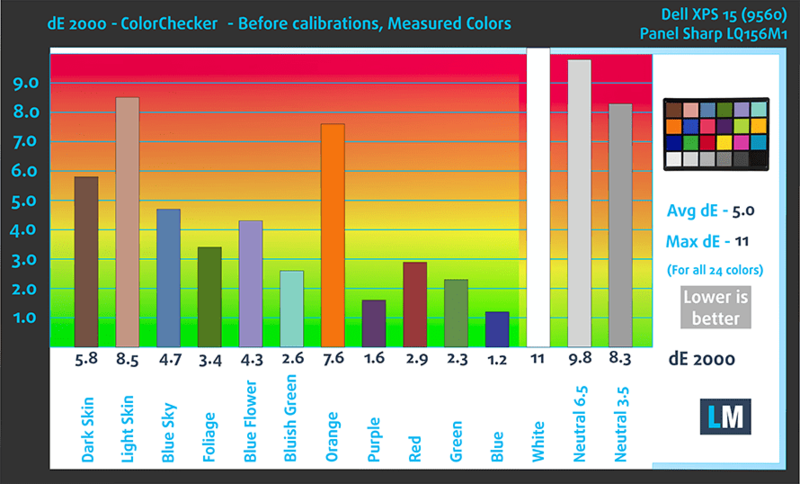 The contrast ratio is extremely high – 1700:1 before calibration and 1450:1 after profiling. The maximum color deviation isn’t high – just 1.9 in the lower right corner. This is an excellent result because values above 4.0 are usually unwanted. In this case, the display covers 95% of the sRGB colors, which is enough for an excellent multimedia and gaming experience. We’ve created the Office and Web Design profile at 140 cd/m2 luminance, D65(6500K) white point and 2.2 gamma. We recorded Fall Time + Rise Time = 34 ms. 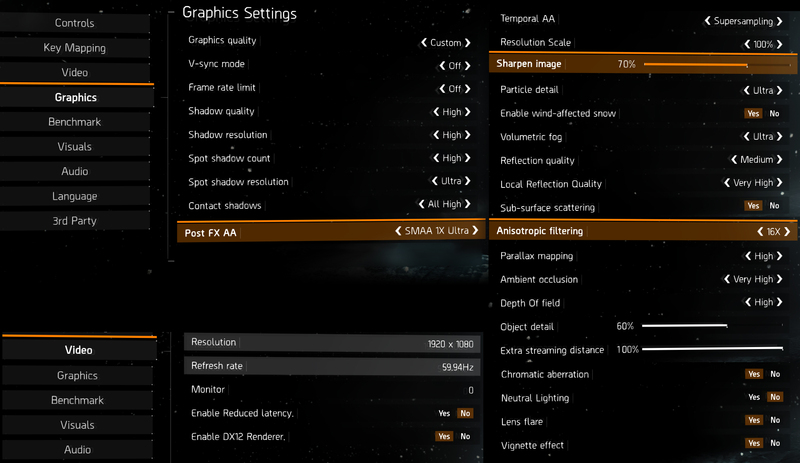 This means that the panel isn’t fast and there will be a noticeable blur during fast-paced games. However, this isn’t a gaming laptop so it shouldn’t be an issue for most users. The panel uses PWM only below 25% screen brightness and at really high frequency so we can conclude that the panel is safe to use for long periods of time. The new XPS 15 uses the old IPS panel from last year but that’s not a bad thing at all. 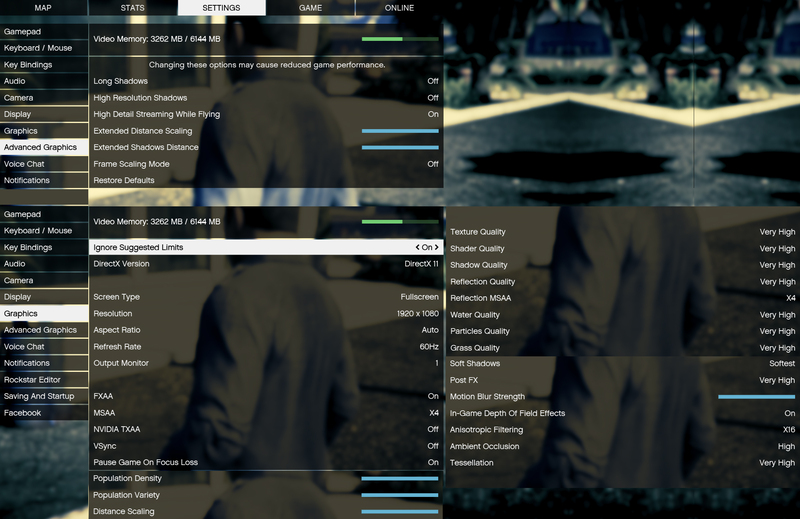 Our tests show that it’s nearly perfect with extremely high maximum brightness, contrast ratio, close to optimal native color temperature, wide sRGB color gamut coverage, making it suitable even for color-sensitive work in some cases, and doesn’t use PWM from 25 to 100% luminance. Of course, if you are planning on usin the laptop for design-related work, we suggest using our custom profiles which will improve the color accuracy quite a bit. 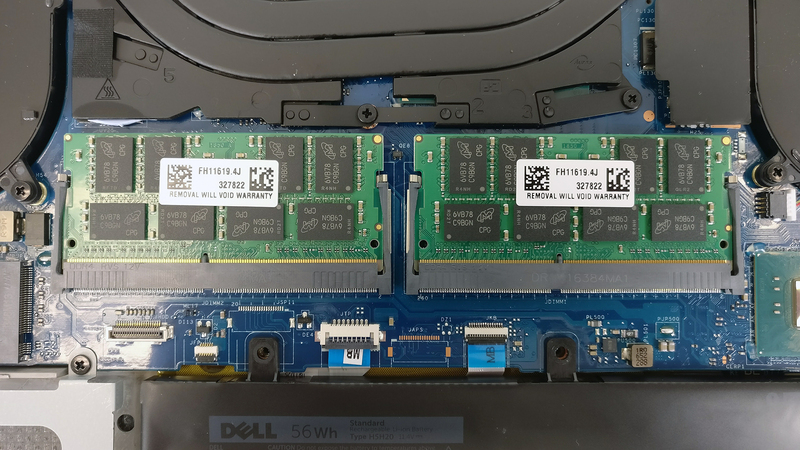 The previous XPS 15 we reviewed had an annoying issue – there was an annoying rattling sound when playing loud music or video. Well, the issue is no longer present with the updated version but it has noticeable distortions in high and low frequencies. There’s not enough clarity. 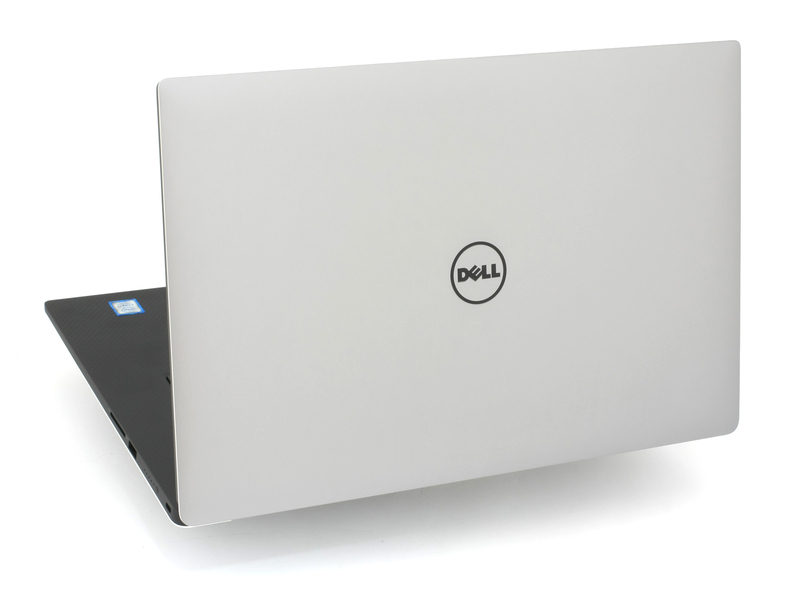 The tested unit shipped with pre-installed Windows 10 (64-bit) but if you wish to perform a clean install of the OS without the bloatware, we suggest downloading all the latest drivers from Dell’s official support page. We have some mixed feelings about the battery. Compared to last year’s model, the XPS 15 has the same 56Wh battery but if you opt for the UHD touch version of the laptop, you will see a significant increase from 84Wh to 97Wh. But that increase will most probably compensate for the power-hungry UHD IPS panel and will not score much higher than the current version configuration. Anyway, the version we tested features a Full HD IPS panel relying on a 56Wh battery leading to slightly below average battery runtimes, considering the price point of the product, of course. The Core i7-7700HQ with Intel’s HD Graphics 630 sure draws a lot of power. 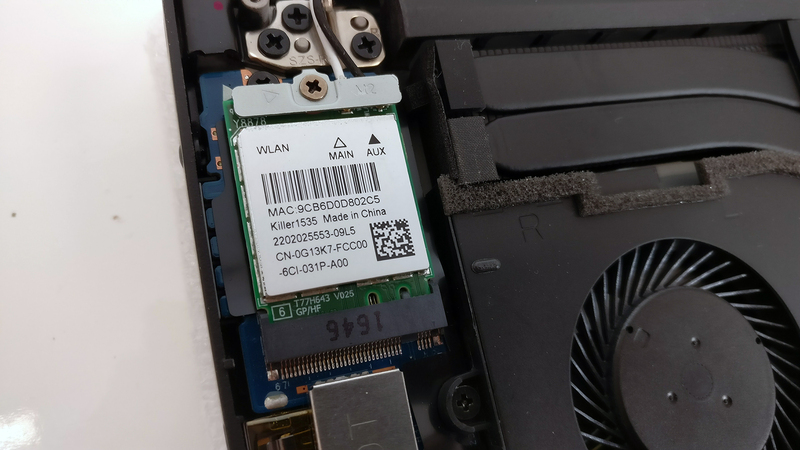 We tested the notebook using the usual settings – Wi-Fi turned on, Windows battery saving feature switched on and screen brightness set to 120 cd/m2. Somehow unsatisfactory result given the price point of the XPS 15 – 338 minutes (5 hours and 38 minutes). Similar but somehow higher result – 347 minutes (5 hours and 47 minutes). It’s quite unlikely that you will start a gaming session without being close to a power source, but it’s good to know that you can play a little less than two hours away from the plug – 111 minutes. Here you can see an approximate comparison between the CPUs that can be found in the Dell XPS 15 (9560) models on the market. 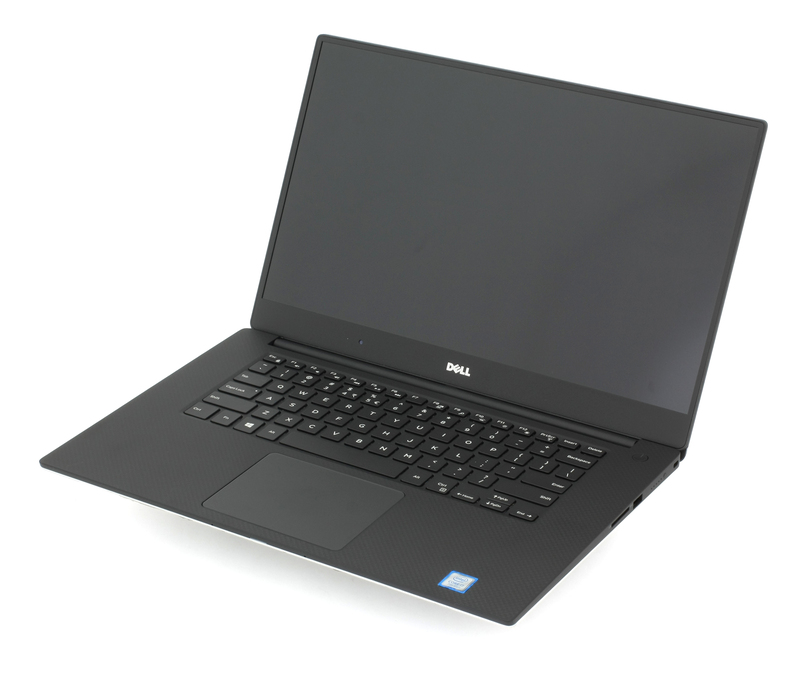 This way you can decide for yourself which Dell XPS 15 (9560) model is the best bang for your buck. Fritz is a chess benchmark that tests the computing capabilities of the CPU with various chess moves. The Intel Core i7-7700HQ managed to get 12.478 million moves per second. In comparison, one of the most powerful chess computers, Deep(er) Blue, was able to squeeze out 200 million moves per second. In 1997 Deep(er) Blue even beat the famous Garry Kasparov with 3.5 to 2.5. 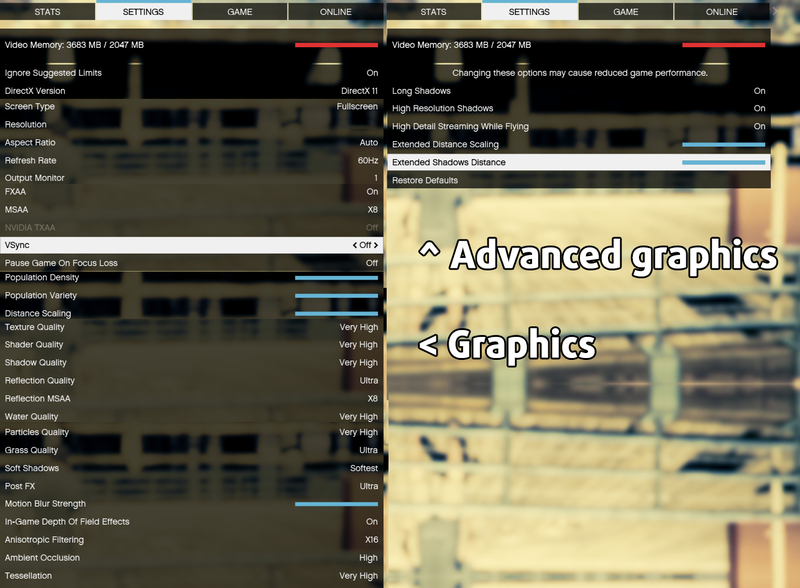 Here you can see an approximate comparison between the GPUs that can be found in the Dell XPS 15 (9560) models on the market. 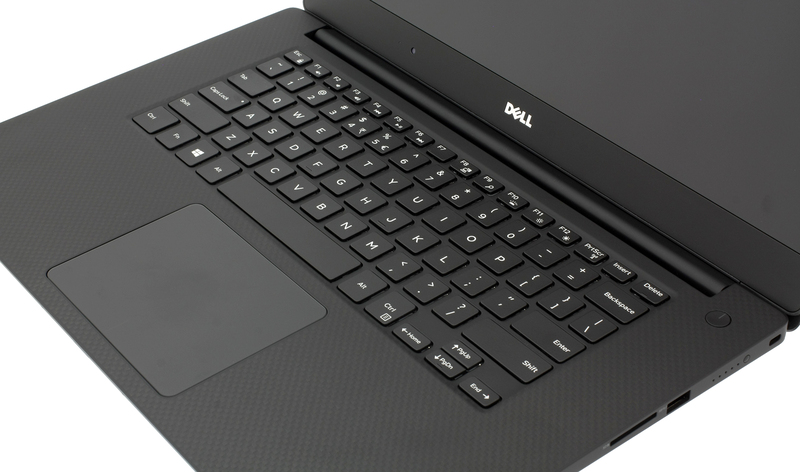 This way you can decide for yourself which Dell XPS 15 (9560) model is the best bang for your buck. The notebook isn’t designed for long and heavy workloads like this and it’s quite unlikely that the general user will reach 100% CPU and 100% GPU load so the two-staged stress test that we perform doesn’t really represent real-life usage. However, it’s still the best way to determine the overall stability and effectiveness of the cooling system. As usual, we start with 100% CPU load for an hour. 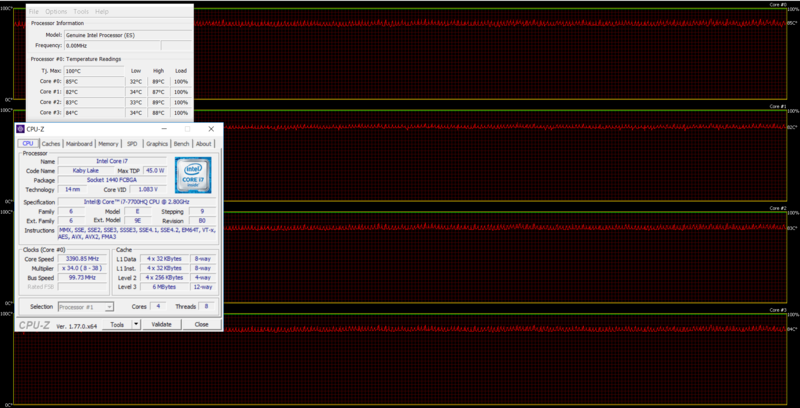 During the first hour, the Core i7-7700HQ was able to sustain its maximum operating frequency for four active cores at 3.4 GHz while the temperatures were relatively normal considering the TDP of the CPU and the nature of the test. Unfortunately, after we turned on the GPU stress test, we witnessed small throttling in the CPU department with clocks going down to 2.5 GHz but still maintaining frequencies between 2.8 and 3.0 GHz most of the time. However, to keep the CPU running at high frequency, the GPU started throttling immediately after we turned on the GPU torture test, even though temperatures didn’t go above 71 °C. Of course, during normal use, gaming or other types of heavy workloads, you won’t experience any thermal throttling but it’s good to keep these results in mind in the long run. Despite the heat generated inside this thin chassis, the interior didn’t get too hot at all. The palm rests remained cool while the upper part of the keyboard was slightly warm, considering the nature of the test. There’s nothing bad to say about the design – it suits the premium price tag of the laptop with an excellent choice of materials and robust construction. The touchpad and keyboard design is just outstanding while the nearly borderless screen makes the laptop one of the most portable, yet powerful 15-inch laptops on the market. Speaking of power, the latest generation Core i7-7700HQ and NVIDIA GeForce GTX 1050 put the laptop into the same ballpark as Apple’s MacBook Pro 15 and probably even outperforms it. It really depends on your type of needs and OS preferences. 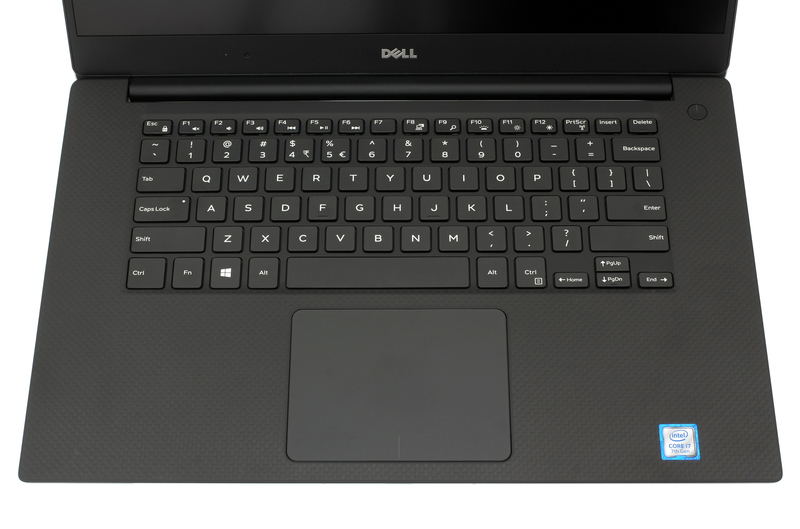 In any case, there is something to be considered with the XPS 15. Our temperature tests hint of thermal throttling of the GPU and the culprit should be the incredibly thin chassis and not the cooling design itself. The latter seems solid. 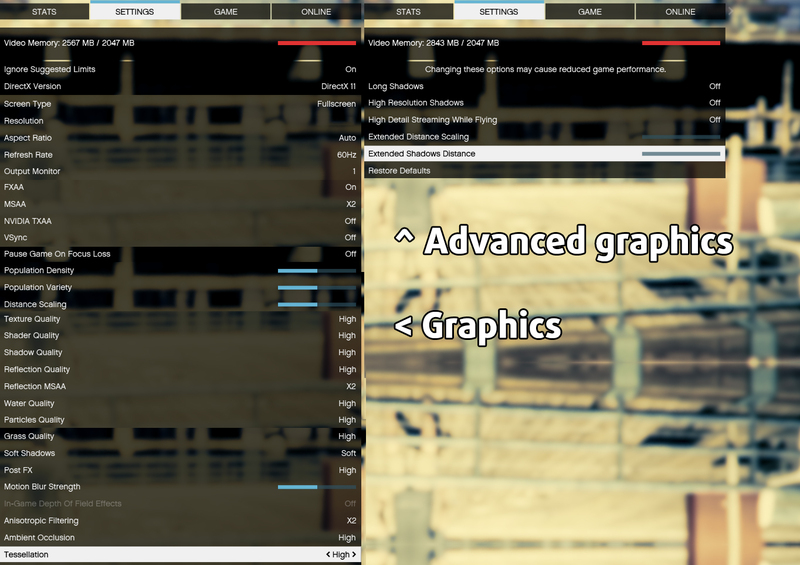 This issue was present in the previous generation of XPS 15 as well but now it’s far less prominent due to the lower thermals the GTX 1050 runs on. And still, the GTX 1050 is considerably more powerful than the GTX 960M, which is a welcomed improvement by itself. 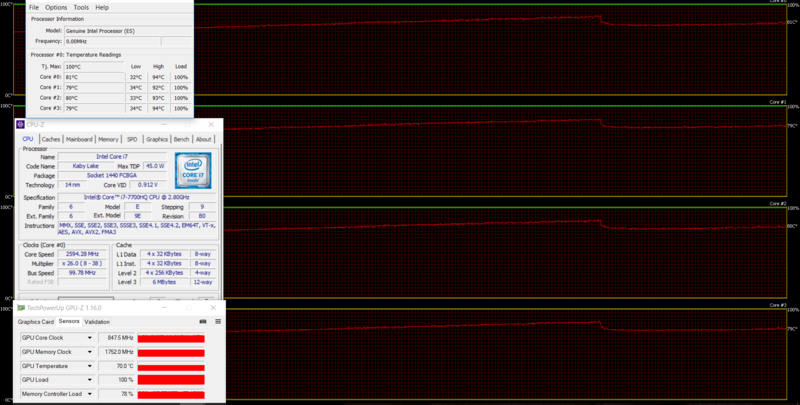 Then again, it’s quite unlikely that you will push the notebook so hard that the GPU will start to throttle. And now some final words on the display and battery. 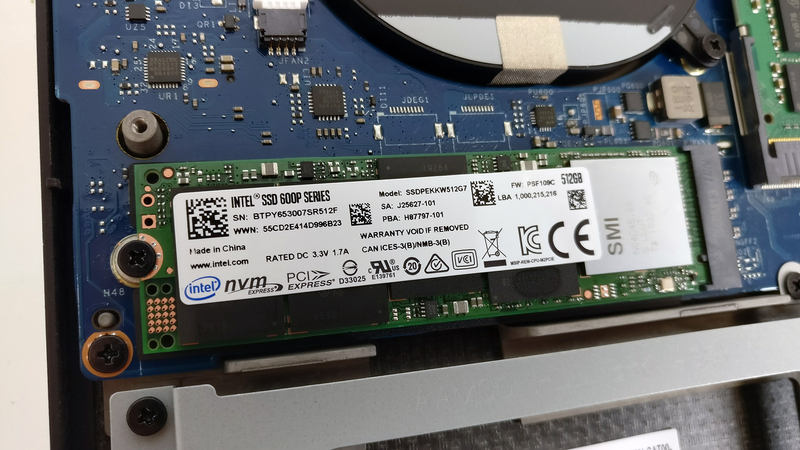 The latter is a bit of a letdown on the model with HDD but if endurance is of high priority to you, we suggest opting for the “only M.2 SSD version” because it sports a larger 97Wh battery. The same goes for the UHD version, although it defeats the purpose of getting a bigger battery capacity. As far as the display goes, it’s one of the best Full HD IPS screens we’ve tested so far. 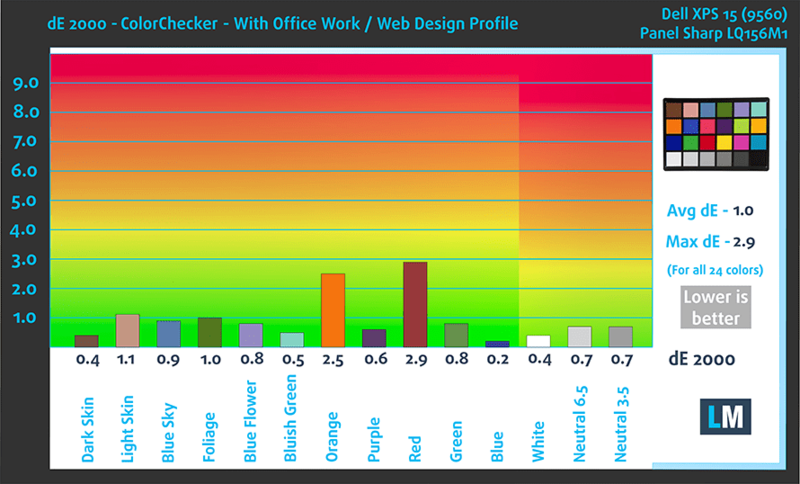 It can even be used for color-sensitive work as long as you pair it with our Office and Web Design Work profile. Last, but not least, it’s harmless to your eyes and can be used for long hours of work as long as you keep the brightness above 25%. Does the XPS 15 offer a good value? Hell, no. But does the price tag justify the quality of the product? It sure does. IF you demand the best possible user experience out of a business notebook without sacrificing performance, the new XPS 15 (9560) is the way to go. 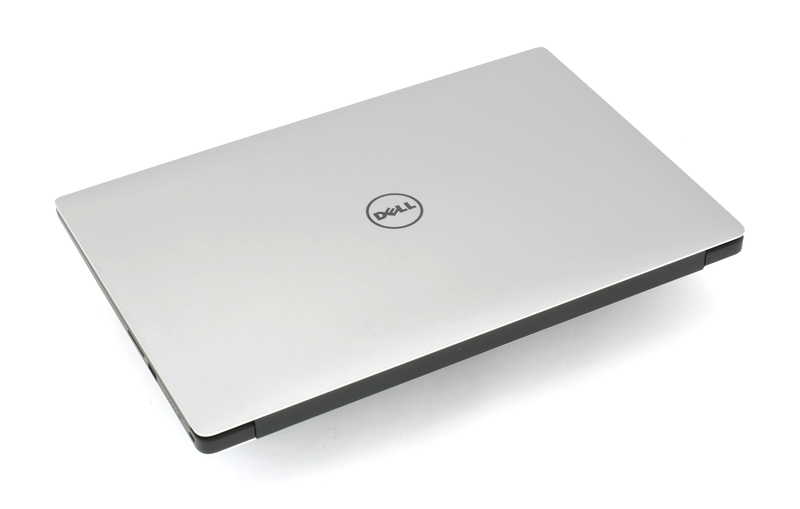 Does the XPS 15 offer a good value? Hell, no. But does the price tag justify the quality of the product? It sure does. and cost 40% less doing it. Does your complaint about the sound just apply to the native speakers or does it also apply to headphones and external speaker output? Thanks for the thorough review. 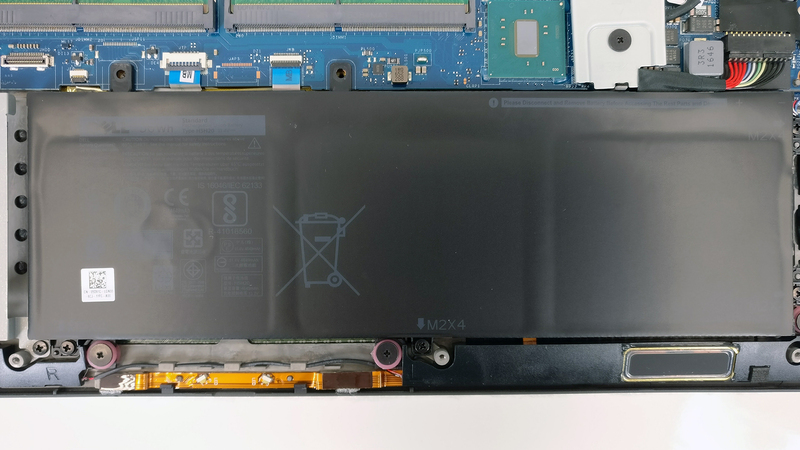 Does the 97Wh battery prevent installing a 2.5″ SSD at a later date, i.e., use space in the chassis that would normally be occupied by the 2.5″ SSD?